Situated in the fast growing area of Bankside, The Loft is the right restaurant in the right location. With its spacious feel and modern décor, you will find that The Loft is the perfect venue for those important business meetings as well as celebratory and less formal occasions. Start your meal with some of new additions from the ever-changing range of dishes, such as grilled goats cheese or tempura tiger prawns, followed by roasted fillet of lamb or belly of West Country pork. At the Loft you will find menus that reflect seasonal trends and boast freshness. Additionally, the menu includes several vegetarian options, and the Chef is happy to accommodate special dietary needs when possible. There could be nothing better to accompany your meal than the Mercure's Signature "Les Grand Vins", a perfect selection of fine French wines at very affordable prices. You could work up an appetite with a pre dinner drink in the Loft bar. Choose from a selection of cold beers, fine wines or premium and international spirits. The Loft Annex can cater for lunches or dinners for up to 50 people as well as cocktail parties for up to 80 people. Menus can be tailor made in order to suit your requirements, style of occasion and your budget. Why settle for a dark and impersonal room when the Loft Annex can offer you natural daylight and intimate private restaurant feel. 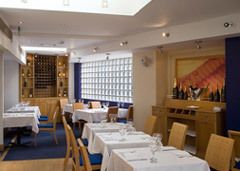 The menu offers global modern cuisine that has already been awarded an AA rosette. The food is accompanied by a wide variety of fine wines from the more than affordable 'Grands Vins' list.